Research is increasingly showing the effects of family, school, and culture on the social, emotional and personality development of children. Much of this research concentrates on grade school and above, but the most profound effects may occur much earlier, in the 0-3 age range. 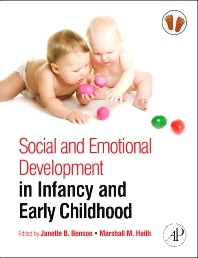 This volume consists of focused articles from the authoritative Encyclopedia of Infant and Early Childhood Development that specifically address this topic and collates research in this area in a way that isn't readily available in the existent literature, covering such areas as adoption, attachment, birth order, effects of day care, discipline and compliance, divorce, emotion regulation, family influences, preschool, routines, separation anxiety, shyness, socialization, effects of television, etc. This one volume reference provides an essential, affordable reference for researchers, graduate students and clinicians interested in social psychology and personality, as well as those involved with cultural psychology and developmental psychology. Researchers interested in social psychology and personality, cultural psychology, and developmental psychology. Janette B. Benson is an Associate Professor in the Psychology Department at the University of Denver. She served for five years as the Director of the University-wide Office of Academic Assessment and co-chaired the successful University reaccreditation. Most recently she served as the Associate Dean of the Morgridge College of Education (2014-2917). Dr. Benson’s expertise is in cognitive and sensorimotor development in infancy and early childhood, and her research has been funded by the National Science Foundation, the National Institutes of Health, The MacArthur Foundation and the March of Dimes. Dr. Benson has published several articles, book chapters and has edited or co-edited several books, including The Encyclopedia of Infancy and Early Childhood Development. She has been the recipient of several awards and honors, including the University of Denver Scholar – Teacher of the Year (1993), the 2000 CASE Colorado Professor of the Year, a Carnegie Scholar, a Fellow of the Association for Psychological Science, member of the Board of Directors of Shortridge Academy, and the serial editor of Advances in Child Development and Behavior. Marshall Haith is the John Evans Professor of Psychology at University of Denver. He has also been an NIMH research awardee, director of research at University of Denver, and Guggenehim fellow and visiting professor at University of Geneva, Switzerland. A fellow of the American Association for the Advancement of Science, American Psychological Association, and the Center for Advanced Study in the Behavioral Sciences, he is a member of the Society for Research in Child Development, the International Society for the Study of Behavior Development, and the International Conference for Infant Studies. Formerly the associate editor of the Monographs for the Society of Child Development, he has served on the editorial board of nine scientific journals relating to infant development and behavior. Recipient of the APA G. Stanley Hall Award for distinguished contributions to developmental psychology in 2000 and the SRCD Distinguished Scientific Contribution Award in 2003, he has authored 10 books and over 75 peer-reviewed scientific journal articles on infancy and early childhood development.